Almost every bar in Spain serves tapas. You can choose to have one with your mid-afternoon caña, or have several to make a full meal. There are the classics — jamón, queso, pimientos, patatas bravas, calamares, and so on — and occasional specials, but the style of presentation is pretty standard. It was a pleasure to discover a variation on the theme this evening in Seville. 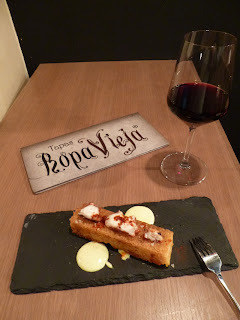 My prize for the best tapas presentation goes to a tapas bar called Ropa Vieja, which is a convenient short walk from my hotel, and quite close to the cathedral. The name means "old clothes" and is also the name of a dish from the Canary Islands. I didn't have that particular dish, but I did have some excellent croquetas and a mini arroz con langostinos. I asked for a glass of Rioja (as you do), but the waitress suggested a Cigales, which she described as "between a Rioja and a Ribera del Duero". Good advice as it went perfectly with my meal. Each tapa is served on a mini slate, which fits perfectly with the sharp, clean style of the bar itself. I particularly like the black ceiling. In fact I love to see people breaking that commandment that seem to be carved on the collective design consciousness: Thou Shalt Paint Thy Ceilings White! Where exactly is it written, that rule?